Our new home has a pool. Rick has always wanted one, and we tell ourselves it will be great for low-impact exercising our aging, aching bodies. The previous owner didn’t swim and saw no reason to clean the pool or maintain the equipment. Cha-ching. Upside is wildlife enjoyed the scuzzy-looking pond, including a river otter for a brief period of time. I suspect he or she decided the pool was a little too polluted after a few weeks and returned to the Laguna. Turkeys had also taken up residence in the area; twenty-six of them. Thankfully, they don’t swim, but they do enjoy scratching for grubs and anything else edible in a lawn or garden. The lawn wasn’t a lawn then, so it didn’t matter. 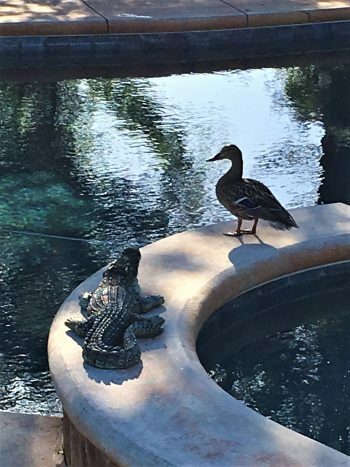 Now that the pool is back up and running with clear, clean saline water, we saw a drake and duck make a perfect landing into the center of the pool. They shook their feathers and paddled around the pristine waters. I had a duck when I was a child, and remember my father’s dismay when my pet decided to swim in our pool and do what ducks do in water. Poo. I threw open the screen door and went out onto the deck. The drake and his lady love flew off. Whew! Thankfully, they didn’t have time enough to leave calling cards. They returned a few days later, looking more determined. Since I’m not home all the time, I knew they’d be enjoying the pool. So, I bought an alligator. Not real, mind you. I do have grandchildren and don’t want them eaten before or after they dive into the pool. My pool man, Ernie, knew where to order a very realistic-looking reptile. I rubbed my hands together, imagining a six-foot long gator in the backyard. It’d be like living in Florida! The beast arrived. All three feet long of it, though it did look real enough to scare our yard guys. For a minute or two. Unfortunately, it didn’t scare the ducks. I think they’ve seen this species of alligator before. I don’t know where the drake was today, but the duck landed on the edge of the spa where I’d placed the ferocious looking alligator. She waddled right up to it and quacked. I’ve sent Sarge out the door, but our city-reared canine companion just looks at his new feathered friend in confused curiosity. “What do you want to do, Mom? She’s sort of cute.” So, guess who is out there running around, flapping her arms and screeching like an attacking hawk? Me. Thankfully, the geese haven’t splashed down. Yet. I’m keeping an eye on the sky.